The role of think tanks in shaping public policy dates back nearly a century to when the Brookings Institution set up shop in the nation’s capital. The idea was to create a “university without students” that could provide research to lawmakers. Today, there are more than 1,800 think tanks in the United States, 400 in Washington alone. They range from liberal to conservative, scholarly to activist. Recently, outside groups have started to demand a higher level of transparency when it comes to where think tanks get their money. They say citizens deserve to know who is bankrolling the ideas that shape our democracy. A conversation about think tanks, influence and independence. MR. STEVE ROBERTSThanks so much for joining us. I'm Steve Roberts of the George Washington University, sitting in today for Diane. She has a cold, but she is on the mend. Think tanks play a major role in shaping public policy. Their reports are distributed among lawmakers, cited by lobbyists, covered by the media. Because of this, outside groups have started pushing for greater transparency when it comes to who is funding their research. Joining me here in the studio for a conversation about think tanks, influence and independence are Tevi Troy, President of the American Health Policy Institute. MR. STEVE ROBERTSWilliam Antholis. He is the Managing Director of the Brookings Institution, the oldest think tank in Washington, almost 100 years old, Bill, right? ROBERTSAnd Eric Lipton, a reporter for The New York Times, Washington Bureau, who's been covering lobbying ethics and corporate agendas. Welcome to you all. Welcome. MR. ERIC LIPTONNice to have you. MR. TEVI TROYGreat to be here. ROBERTSI should also mention Tevi Troy's new book. What Jefferson Read, Ike Watched and Obama Tweeted: 200 Years of Popular Culture In the White House." Congratulations on that, Tevi. ROBERTSYou can join our conversation here in the -- at "The Diane Rehm Show." 1-800-433-8850 is our number. Email us at drshow@wamu.org. Join us on Facebook or Twitter. We are open to your calls and your comments. My first question is sort of a basic one, Eric Lipton. You cover this area for The New York Times. Why should we even be talking about think tanks? Why are they so important? LIPTONWell, not only do they influence the debate in Congress and the administration, over policy matters from healthcare to defense to just about any topic you can consider, but they're also actually a pretty significant economic force in Washington, D.C. They employ a lot of people, they collect a lot of money from corporations and from other parties, from individuals, from foundations. And they have a lot of influence. They do sway opinion, not so directly as a political party might, but by contributing to a discourse in a way that influences the outcome. LIPTONAnd so, they're not as noisy as the political parties, but they have a great deal of influence. And so, if you want to understand how Washington works, you need to understand think tanks. ROBERTSAnd Bill Antholis at Brookings, as I mentioned, the oldest and often considered the first think tank in Washington, have you found, in recent years, putting more effort into -- injecting your views into the conversation in the way Eric is talking about? ANTHOLISAbsolutely. We -- our three core values are quality, independence and impact. And impact is the thing that I think sets us apart from our peers in the universities. Which we, on the quality side, try to stay -- keep up with. But we think that we have a sort of well oiled system of getting ideas injected into the public policy process. I think there are two challenges, and one, it has become a much more crowded marketplace. So, we're having to compete in all the different media technologies, the air war that is everything from broadcast to social media, as well as the ground war. ANTHOLISGetting directly to policy makers. The interesting challenge there is sometimes being too visible can damage your relations with policy makers. If the policy makers themselves don't think that they have been responsible for the idea and the execution, you can get in the way. And so, sometimes, some of our most effective impact is done in a really quiet way. ROBERTSWell, and it's also a competitive marketplace for funding. ANTHOLIS...talk about, and we spend a lot of time thinking about and worrying about. frankly. ROBERTSAnd Tevi Troy, you have done a really interesting article on the history of think tanks, and one of your points, and you've worked it a number over the years, and -- that there has been a shift, strongly, into the world of advocacy. The analysis has always been there, the role of policy analysis, but you're seeing, over the last generation, a real toward more direct advocacy, even beyond the impact that Bill talks about. TROYAbsolutely. What I notice is a phenomenon that I call lose an election, gain a think tank. When different parties have lost elections -- so, when the Democrats were losing elections in the 1980s, they came up with the Progressive Policy Institute to help move the Democrats to the center. When the Republicans lost the 1992 election to Bill Clinton, in part because of the Progressive Policy Institute, and the ideas it brought Clinton, the created a number of think tanks. TROYOne of them later morphed into the Weekly Standard. After the 2000 election, the Democrats created CAP, the Center For American Progress. And I've noticed that each one of these iterations becomes more and more aligned with the party's partisan interests, which I think takes away from independent analysis. ROBERTSAnd perhaps the best example of that is The Heritage Foundation, which, often compared to Brookings as the conservative version of Brookings. Founded in the 70s by Congressional staffers, who, in your analysis, eager to make more of an impact on the public policy process. But in recent years, become even better known for its advocacy arm and its entry into politics. TROYYeah, absolutely. The story you're alluding to is a famous story that Heritage brags about. Its origin story, where Ed Feulner and Paul Weyrick were aids on Capitol Hill, and they were frustrated that an analysis came from The American Enterprise Institute after a key vote had happened. And they said that this might have changed the impact of the vote if the AEI analysis had come sooner. So, they went and they called AEI, and they said what happened? And AEI said, well, we're a non-partisan organization. TROYWe didn't want to impact the influence -- we don't want to impact the vote. And they said, well, that's precisely what you should be doing. And they went out and they created this new institution called Heritage. And Heritage was designed, and they say this explicitly, to have members of Congress be able to read one of the executive summaries of their reports on the way from the Rayburn Building on the House side, or the Hart Building on the Senate side, on the way to the Capitol to cast their vote and get their sense of how to vote based on the executive summaries of their analyses. ROBERTSBut in choosing a new president to succeed Ed Fuelner, the gentleman you mentioned, who was there for many, many years, they chose Jim DeMint, a former senator from South Carolina, very closely aligned with The Tea Party, very closely aligned with the theory of driving moderates out of the Republican Party. This was a step toward politicization, even beyond the founders of Heritage. TROYI think what happened with Heritage is that they saw the Center For American Progress, which was very successful on the Democratic side. And, you know, there are so many Obama staffers, that going into the -- that went in from the Obama -- from CAP into the Obama Administration, that when one left the Obama Administration to go back to CAP, it was called a transfer, by Tim Carney, at the Washington Examiner. So there's that constant churn between the two of them. ROBERTSThese are, these are portions of the tax code we're talking about. TROY...right. Tax code provisions that make think tanks non-partisan. When you have a C4 arm, in addition to a C3, that allows you to engage in partisan activity. CAP, the Center For American Progress, had one of those, and Heritage said, we're gonna get one of those, too. And that pre-dated even Jim DeMint's arrival at Heritage. ROBERTSAnd Eric, one of the things that I've noticed, in my years here in Washington, is that the growth of not only Heritage, but many other think tanks of explicitly conservative origins, were really spurred by Ronald Reagan. And spurred by his idea that you could come to Washington as a conservative and have an impact on public policy. In an earlier generation, a lot of the people, young conservatives, would go to Wall Street. And he made it attractive to come to K Street and come to Washington and be part of this dialogue. ROBERTSAnd this is part of the history here, that there's a very robust group of conservative foundations and think tanks. And very well funded by conservative contributors. LIPTONYeah. No doubt. I mean, I guess traditionally, you think of academic world as being a liberal world, you know, sort of the ivory tower. And war causes, you know, anti-war causes and other things like that. But in fact, in Washington, you know, the conservative contingent of think tanks is equally as strong, or perhaps now, growing even stronger than the liberal sides. And, I mean, what -- in talking about Heritage and Heritage Action. LIPTONI mean, they're -- the -- the kind of the think tanks that become doers as opposed to just sort of presenting their studies, but then decide that they want to actually make that policy become real, is something that I think, you know, even the more traditional ones are struggling with, as to what role should they play. And it invites in people of, you know, sort of politically active people. Conservatives and liberals who think that the think tank can be a place where I'm not only an academic writing in the ivory tower, but I'm actually a policy maker, in a way. And I can become -- I can affect policy directly. So, I think that they have become a place where people go, and then they pursue political careers, in fact. ROBERTSAnd Bill, running Brookings these days, do you feel buffeted by this new trend toward more activism. Is it hard for Brookings to keep steady with your traditional mission? ROBERTSYour president is a former member of the Clinton Administration. ANTHOLISAnd I served in the Clinton Administration, as well. ROBERTSAnd do you make a big effort to do that, to have a bi-partisan roster? ANTHOLISYes. Well, bi-partisan and non-partisan. And the question for each of our scholars is, do they start with questions, not answers. And the way that we sort of came to that was in doing some research around town, that was not about Brookings, but about think tanks. The Chief of Staff for a Republican senator said it best, which is look, for many think tanks, and he was talking about the ideological ones, our relationship with them is, we know the answer we're looking for. And this is the game show, Jeopardy. ANTHOLISThe answer's on the board, and we're looking for a question that matches the answer that we already know and want. And we like it that way. And then the person paused, and they said, you know, the one place that's different, and there are several that are -- I don't want to say that we're the only place, but this person said, the one place that's different is Brookings. I think they actually start with a question. Sometimes I can't figure out what the answer is, and that was a message to us nine years ago, that we had to be much more specific about what our recommendations are. ANTHOLISBut doing that without starting with the answer. So, you have to ask a question in the process of doing research, a legitimate question. And so, we're looking for scholars all across the political spectrum who are willing to challenge presupposed ideas with questions. But once they have the answer, argue effectively for them. And that's a real balancing act for us. ROBERTSAnd quickly, what role do funders play in this? ANTHOLISWell, maybe we can do that after the break. I hear music in my ears here, so it's really -- it's hard and important to get right. ROBERTSAll right. Bill Antholis of Brookings. We'll come back with more conversation about the funding of these think tanks. Eric Lipton of The New York Times has written extensively on this. So has Tevi Troy, who's President of the American Health Policy Institute. Give us a call. We have some lines open. 1-800-433-8850. I'm Steve Roberts sitting in for Diane. We'll be right back. ROBERTSWelcome back. I'm Steve Roberts sitting in today for Diane. Our subject this hour, think tanks here in Washington and around the country, how they're organized, what their influence is, what their sources of funding is. Bill Antholis is with me. He's the managing director of Brookings. Eric Lipton, reporter for the New York Times covering this subject. And Tevi Troy who is the president of the American Health Policy Institute. Our phone number 1-800-433-8850. Give us a call or send us an email and/or Tweet or a posting on Facebook. We will get to your questions. ROBERTSAnd Tevi, you wanted to talk about the point that Eric was making that there has been this very significant growth of conservative think tanks heavily funded by conservative donors. And you have a thought about sort of how and why this has happened. TROYYeah, it didn't just happen by accident. The conservatives, for a long time, have felt uncomfortable in the universities and unwelcome in the universities. And we see this recently with the spate of conservatives who were told that they can't speak in commencements, whether its Condi Rice or Ayaan Hirsi Ali at Brandeis. And so conservatives -- there's still a big community of conservatives with policy ideas and with PhDs. And so instead of going to universities where they were not welcomed they started coming to think tanks in the 1970s. TROYWe talked earlier about Ronald Reagan's role in bringing them in but they actually helped propel Reagan to power by coming up with a lot of the ideas that he pursued in his campaigns both in '76 and '80. And then when he won the president in 1980, they staffed a lot of the positions within his administration. So it wasn't like academics who had backed John Kennedy for example. And many of them stayed in the universities, although some came to Washington. TROYThere was a whole group of people who came with Reagan to Washington. And then they also -- they staffed think tanks like Heritage, Hoover, AI and Hudson. And they helped those think tanks continue to generate new ideas for conservative leaders. ROBERTSAnd I think one of the ways in which the growth of these conservative institutions have influenced the public debate is in the media. Whether it's on this show or any other, there's always a well-financed and a credible conservative voice on whatever subject that has a perch in one of these think tanks. And that perhaps wasn't true a generation ago but it is much more true today. TROYAbsolutely. If you're looking for someone to speak on a topic, you might go to a university to find a liberal professor who covers, let's say, housing policy. But you look on the conservative side. You can't go to the universities. You look to the think tanks. And the person at the think tank might be more apt to speak in clear policy language, might be able to explain issues, might have more media background and more media training and hence become more articulate spokes people for these positions. ROBERTSDid you want to add something, Bill? ANTHOLISYeah, I mean, as with Heritage, there are some scholars there that ask really hard questions on the Democratic side about the future of the party, just like for years. And I think the challenge is, as the institutions and its heritage became more top-down, the question is, will they be able to keep their scholars that are willing to ask their own party hard questions? And, you know, I think CAP has done a good job of that. 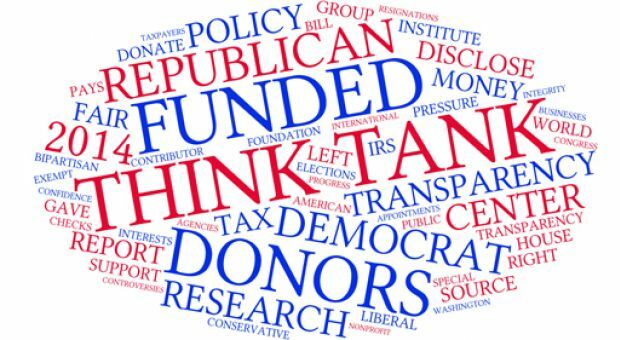 Some labor organize -- labor-funded think tanks follow the party line on issues on the left. So I don't think it's really -- I don't think it's just a right-of-center issue. I think a lot of the left think tanks have the same set of challenges. ROBERTSWell, Eric, that brings up a subject you've written on and talked a lot about, which is the funding sources for some of these think tanks. And you have a very good example of two think tanks that operate on economic policy and consistently reflect the biases and the interest of their funders. LIPTONRight, there are two. And they have incredibly similar names. And this is actually not a coincidence that they do. One of them is the Economic Policy Institute which is on the left leaning side and supports an increase in the minimum wage. And about 30 percent approximately of its funding comes from labor unions and other foundations. LIPTONThe other one is called the Employment Policies Institute, so both go by EPI. And the Employment Policies Institute is funded by the restaurant industry and other, you know, hospitality industry groups. And they're intensely opposed to a minimum wage increase. And they both publish repeated studies. One's saying that increase the minimum wage and you'll reduce poverty and improve the standard of living in the United States. And the other is saying, increase the minimum wage and you'll actually increase poverty because fewer people have jobs because restaurants will automate things. LIPTONAnd so they both are -- you know, and they're both contributing to the -- kind of the background noise in Washington with their reports and their advocacy. And it sometimes is hard to know, you know, is this a research that's based on, you know, economics, policy and, you know, legitimate science or is it, you know, advocated based by who really is funding it? You have to sort of wonder that question. ROBERTS...if you are a 501C3, the section of the tax law we've been talking about, you are not required by law. So it's not as if anybody is breaking the law. But you have a strong feeling that from a policy point of view, if not a legal point of view, it would be beneficial to have more transparency. ROBERTSAs Bill said, having the answer first and then ask the question. LIPTONRight, right. It will be distributed on Capitol Hill. Maybe the organization that asks for it will issue a press release calling attention to it but not to claim credit for having initiated it. And then it goes to specific media groups that are, you know, familiar to them and that are, you know, sympathetic to that side. And each has its own sort of line of media that it uses. And then there's this echo chamber effect of, you know, it's repeated and then the think tank is cited and then the organization that essentially, you know, solicited it and repeats it and it creates this whole process of, you know, surrogates. LIPTONAnd the think tanks -- to me that's why the transparency is so important because you have to know where the money's coming from in order to evaluate the report and to understand sort of what's the basis that -- you know, who is it, you know, that perhaps contributed. And even though the think tank can argue, you know, the contribution has nothing to do with the outcome of this report. As a reporter, as a citizen you still want to know who gave the money, how much did they give and, you know, what role do they play in your organization. ROBERTSAnd Bill, running Brookings as you do, I know that Brookings has voluntarily moved toward a position of revealing much more about your donor base. ANTHOLISWell, we've been doing that for a long time, every since I've been at Brookings and took over as president 12 years ago and even before that. We always publish our -- in our annual report we publish our donors. We publish something like 98 percent of our donors. There are a few donors that choose to remain anonymous. ROBERTSAnd you give them that option? ANTHOLISWe -- it is an option that they can choose. We don't present it to them. The default setting is, we're going to publish. And part of the reason for that -- first of all, many donor, in fact, most donors want to be public, or at least our donors. They want to show their philanthropy and they want to be seen in the community -- whether they're corporate donors, foundations or individuals, seen in the community as good citizens. ROBERTS...both in reality and in perception. ANTHOLIS...in reality and perception. I mean, I was a negotiator at the famous or infamous Kyoto negotiations. I've been writing on climate change. I have a book on that from a few years ago. Exxon-Mobil has been a funder of Brookings ever since I've been there. I know their government affairs people very well. I know their -- and their own views on the issue have evolved overtime. ANTHOLISAnd we like to think that that's part of our impact is educating companies that have different views on the issues and engaging in a dialogue with them. They've been very open about their funding to Brookings and we've been very open about our relationship with them, even though on this issue we've been in a different place at times. ROBERTSTevi Troy, what's your take on the virtue -- on this debate about whether there should be more transparency on funding sources, even though as we've said, it's not required under the law now? TROYYeah, I have a slightly different take than Eric. I think that I'm a fan of transparency. And if -- in my particular think tank we publish the names of our board of governors on our website. But I think that there should be an option for donors to remain anonymous. Because if you look at, for example, what Harry Reid is trying to do to the Koch Brothers who donate a lot of money to political causes but also to think tanks, he's demonizing them for their contributions. TROY...they won't accept more than X percent, usually low single digits, from a single donor. So they are not beholden to the interests of that one donor. We are also working on a rule similar to that about a 2 percent rule in my think tank, so you're not getting more than 2 percent of our corporate revenue from one donor, so that we can't say -- so we can say that no one donor says that this is how you should study things and then we are beholden to their interests. ROBERTSThe other point you've made on this subject, Tevi, I found quite interesting. Bill talked earlier about the competitive marketplace, both in terms of ideas but in terms of funding sources and that some organizations are reluctant to publicize their donors because they're afraid other organizations are going to say, wait that could be a good source and then in effect poach them because it is a competitive marketplace for funding. ROBERTSWell, they're based at Stanford in California. TROYRight. So a lot of these think tanks are quite aware of what their funding pools are and who to go to. And, you know, there's not that many billionaires who are identified with particular causes and so they are frequent recipients of the interest of these think tanks (unintelligible) . ROBERTSNow Eric, Bill pointed out that there are a number of corporate sponsors who want to be seen as good citizens. They want to be associated with a brand like Brookings. It carries a certain luster. But you're also saying that there are plenty of people who are in this to buy influence and not just a reputation. LIPTONI think that -- yeah, I think -- you talk to lobbyists in Washington and, you know, confidentially when I speak with some lobbyists they tell me about how they work with think tanks. Not necessarily, you know, naming them but to get reports that will produce the outcomes that they want to support their causes on The Hill. I think this happens particularly with financial services matters. ROBERTSThis group in -- as we should say, was funded by George Soros. LIPTONRight. George Soros, right. And actually ranked George Soros' think tank as one of the worst -- the least transparent, although he argues it's a foundation and not a think tank. But, I mean, there -- something is happening in Washington right now. This whole conversation we're having about transparency and think tanks is actually having an effect. LIPTONAnd, I mean, there are quite a number of major groups, the Stimson Center, the World Resources Institute, the Carnegie Council for Ethics, the German Marshall Fund, that are moving in the direction of pushing more information onto their websites about who their funders are. And it's actually -- it's pretty significant in the history of disclosure. ROBERTSAnd of course this technology makes it a lot easier. But you publish it in a printed report that gathers dust somewhere. Even if you print it no one's going to see it. But at least this is far more accessible. LIPTON...you know, there's researchers at the Edmond Safra Center at Harvard that are pushing this issue. And there's a lot of focus right now that's going on on this topic. ROBERTSHold a second. I'm Steve Roberts and you're listening to "The Diane Rehm Show." Yes, Bill. ANTHOLISI'll tell you, we are paying attention to how the debate itself was evolving and trying to learn from our piers in the think tank world about what they think best practices are as well as places like the Safra Center. So after conversations with Larry Lessig who runs the Safra Center, we've decided to disclose a little bit more about our foreign funders, which had become a subject of conversation. ANTHOLISWe now disclose which research programs within Brookings they give resources to. And we think that that was a step forward. You know, I think some of these organizations really want full disclosure of every single dollar spent at a place like Brookings. And frankly that's a little bit more than we want to do. And the reason that we don't want to go to that level is it's very hard to spend a lot of time accounting for every plane ticket you purchased. Was it purchased for this subject or that subject? ANTHOLISAnd, you know, we're a small organization by university standards. We're $100 million a year. But tracking 100 scholars and every expenditure, if we spend all of our time doing that, we're not doing our research itself. ROBERTSAnd Tevi, this larger question of people funding research or funding experiments and having a vested interest in the outcome, it's not limited to the think tank world. You look at the world of pharmaceuticals for instance, medical trials that are often sponsored by pharmaceutical companies, you look at universities. There have been significant issues in recent years of people giving money for chairs and research projects where they had a vested interest in the outcome. So money seldom comes with no strings of any kind. TROYThat's true. And also, there's this issue of scholar credibility. I mean, I think it's unfair to say, well, a think tank got money from a pharmaceutical company, therefore everything they write on the subject is tainted. Scholars develop their own independent reputations. At credible think tanks you don't let any outside funders read the reports before they come through. I also think that think tanks, for the most part, shouldn't let maybe perhaps the senior management or the fundraisers read reports before they go through. TROYScholars have to develop their own independence and reputations. And it's harmful to their reputations if they're seen as beholden to the interest of a particular sector. ROBERTSAnd that's exactly what happened with Heritage and their report on the economics of immigration. ANTHOLISAbsolutely. And this is where the peer review process is really critical. I mean, I think that that's where the focus on think tank credibility should be. You know, trying to track -- by the way, we do track every dollar for tax and accounting purposes. We have to do that. But trying to track every dollar to which funder it should be attributed becomes very complicated as opposed to looking at the product itself. Was it done in a rigorous way? Did outside people have a chance to look at it? For every book and every long report we do at Brookings we do that. ANTHOLISFor op-eds, which have to be written very quickly, it's a little harder to do that but we have our own internal quality control measures even on something like that. ROBERTSEric, what are you seeing in terms of these trends? Are you seeing, in addition to this move towards transparency, more peer review, trying to limit the funding of any one organization to certain percentages? Is this part of the trends you're seeing in the think tank world? LIPTONI think that there's more focus on this question of where is your money coming from and what is the money, if anything, buying? And then therefore there's the discussion of that. And even -- the discussion is healthy even if the argument back is it's not buying a result. It's -- but it's a healthy discussion. But I think sort of why are we having this conversation? You know, and I think the answer is that this matters to the public in a big way because, you know, very little comes out of Washington right now in terms of actual legislation because of the state of congress. LIPTONBut when legislation does emerge it usually is influenced in one way or another in the margins and in the language by think tanks. And so I think that, you know, we need to understand their role in that. ROBERTSThat's Eric Lipton from the New York Times. Also with me, William Antholis from the Brookings Institution and Tevi Troy from the American Health Policy Institute. I'm Steve Roberts sitting in today for Diane. We're going to be back with your Tweets, your emails and your phone calls, so stay with us. ROBERTSWelcome back. I'm Steve Roberts, sitting in today for Diane. Our subject, this hour, think tanks. Their influence on policy and politics in Washington, around the country. Three experts with me. Eric Lipton from The New York Times, William Antholis, who runs Brookings and Tevi Troy of -- the President of The American Health Policy Institute. Let me read you an email from Brian, who makes a very interesting point. We live in an age where people can choose not only their sources, but also choose their own facts. ROBERTSWhen people can't even agree on basic facts, how can any policy debate be meaningful? How can these think tanks come up with such different answers when they are theoretically working from the same information? Bill? ANTHOLISWell, you know, it's one of those great lines in American politics, that everybody's entitled to their opinion, but you're not entitled to your own facts. ROBERTSSenator Daniel Patrick Moynahan, the author of that quote. ANTHOLISExactly. And, you know, we're very rigorous on that, and we try to work with other organizations. We have partners in a lot of think tanks, where we share ideas. We peer review up one another's work. And when facts come in that just don't stand up to that, we try to call them out on it. We try to do a lot of policing on the substance of our research, but also on the management of it. ROBERTSBut doesn't the caller have a point, that increasingly, in Washington, this whole notion that there is an independent set of facts, that whole notion is under question. ANTHOLISAnd the audience for it, as well. When you, I mean, for us, the big existential threat, frankly, is that the most conservative Democrat is to the left of the most liberal Republican in the Senate. There used to overlap of the two political parties. ROBERTSYou have to solve problems. ANTHOLISYou have to solve problems. ROBERTSAs opposed to making speeches. ROBERTSTevi, as someone who's worked in administrations, also been at a number of think tanks, pick up on this very important point that our caller Brian raises. In this current atmosphere, is it harder for serious scholars to say there is an independent set of facts, apart from the politicization of the debate? TROYLook, I think it goes back to the point I was making earlier about scholar credibility. You put a paper out there, and your credibility is on the line. And if you are seen as taking money from a corporation for that -- coming up with that idea, or if you put out facts that are generally mocked and derided, and shown to be not true, I think that will harm your scholarly reputation, as well. I think the internet, in some ways, is a great equalizer in that. I mean, you've got all kinds of fact checkers out there, who look at reports. TROYAnd let me also issue a brief defense of think tanks, in case some of the listeners think that they're some kind of nefarious organizations. I've spent, as you said, the course of my career in public service and in think tanks. And think tanks have actually come up with some great bipartisan ideas that have really helped this country. The Marshall Plan helped come out of Brookings, and it helped recover, in Europe, from World War II. You had welfare reform came largely out of the Hudson Institute, where I used to be, and that was a bipartisan bill passed in the 1990s under Bill Clinton. TROYYou had de-regulation was pushed heavily by AEI in the 1970s, and it was very helpful in driving down airline prices, for example. So, I think there are some excellent policies that have come out of think tanks, and I think it's useful to have these independent organizations, to the extent that they are independent, that can come up with great new policy ideas. ROBERTSAnd Eric, you work for an organization at The New York Times, which, in its way, tries to hue to the same values that Bill was talking about about Brookings. An independent source of facts that people can agree on, apart from politicization. Your take on the debate that your two colleagues have been having here. LIPTONI think the point that Tevi makes, which is that, you know, the scholarship is what matters, and that the internet can sort of, you know, to figure out bias, is not actually -- I don't entirely agree with that. Because, the pace of policy discussion in the world today has so quickened, and the internet, and the way things can sort of be released and then boosted into, you know, the story of the day so quickly means that there isn't the time to -- for the knockdown of that report. And that's why the first thing I want to know is well, who funded it, you know? LIPTONAnd again, it's not gonna mean that I'm gonna -- I just want to know that information as I'm being given the report, so I can evaluate it. And as I think about -- okay, as I read the report -- that helps me more quickly than I'm able to sort of knock down the facts, because it's information you want to know. ROBERTSLet me turn to some of our callers here. I want to turn to Joe in Gainesville, Florida. Joe, welcome. You're on "The Diane Rehm Show." JOEHi there. Glad to get on the air. I'm kind of perturbed that it seems like there's no left wing think tanks, really. And I kind of object to the term think tank toward things like Heritage Foundation, because they seem to be more of public relations outfit that crafts things for legislation. And the groups that are funded by the Koch Brothers are crafting legislation. There's nobody on the left doing that. JOEMy question would be to address think tanks with regard to the idea of healthcare, and especially single payer healthcare. Because I believe a lot of people that are dissatisfied with Obamacare are dissatisfied because it didn't go far enough. They wanted single payer, like the rest of the world has. Who were the think tanks on the two sides of that? ROBERTSOkay, thanks very much. Tevi, you were talking earlier, that -- about the Center For American Progress, which very much is a explicitly liberal think tank. You were talking, Eric, about others in the economic field financed by labor unions. Answer the caller on this question. TROYThere are a ton of liberal think tanks out there. The Center For American Progress, obviously. The Center For Budget and Policy Priorities. They certainly get a lot of play in the press. Brookings -- I know you call yourselves independent, but there is certainly a center left lean, or at least that's how they're perceived. Urban Institute. So, there are a lot of think tanks that have liberal leanings or ties. I think the point I was making earlier is that conservatives felt uncomfortable in the universities, and so they helped develop this grouping of conservative think tanks, and they did it before liberals did. TROYAnd so, in some ways, liberals like the Center For American Progress Institution were trying to catch up, because they saw conservatives develop an advantage in think tanks. But I think there's plenty of think tanks on both sides. You know, there's 400 think tanks in Washington, and 1800 across the country right now. ROBERTSLet me turn to Marcus in Greenville, North Caroline. Marcus, welcome. You're on "The Diane Rehm Show." MARCUSThanks for taking my call. Just listening to this issue, it made me wonder, if you guys get a sense that the people who write reports, basically answering questions that they already know what the answer's gonna be. They're just kind of doing research to support a view. Do you get a sense that they feel, in some way, that their work is illegitimate, or that there is any kind of conscience? I mean, this is information that politicians use to craft policy, and if it's based upon -- if you know that, you know, we just basically skewed the numbers on this report, then you pretty much know that this is being -- a decision is being made invalid. MARCUSAnd so, do you get any sense that these people kind of feel -- you know, they understand that this hurts the country, this hurts people, when decisions are made based upon faulty reports. ROBERTSMarcus, thanks so much for your call. We've been talking about this subject. Bill, do you have a further response to Marcus? ANTHOLISWell, Marcus, I mean, you know, as a general matter, I think most people at Brookings shake their head in the way that I hear you shaking your head. That said, I'm certain that there are people out there that believe strongly in outcomes that they're advocating for. And they're willing to go out and get facts, or even maybe, sometimes, make up facts to support the cause that they're -- that they're pushing for. And, you know, from our perspective, the key is to get really well trained scholars, who know, not only how to ask questions, but how to ask themselves questions. ANTHOLISHow to really challenge their own analysis and get peers to challenge their analysis. ROBERTSIt's also scholars who have a connection to real public policy issues. ROBERTSSometimes, and I teach at a university, and there are plenty of scholars there who build abstract models and don't have much relation to the real world. The real -- what you're looking at is a nexus between scholarship and policy. ANTHOLISAbsolutely. And that's what makes Brookings such a special place to work. I mean, Tevi was talking about whether or not there's a perception of Brookings being left of center. In the world of health policy, where Tevi worked, the founding director of our health policy served in the Bush Administration. Mark McClellan, he likes being at Brookings because Alice Rivlin, who served in Democratic administrations, is in the same research program, and now in the same health policy center. They challenge each other, but they know how to get things done. ANTHOLISAnd it's that combination of asking questions, but eventually getting answers and putting them into the public sphere. That's what makes Brookings work. LIPTONAnd I don't know if it's too often that you'll have a report where the numbers are made up, or where -- you know, it's really just distorted in a just gross way. But, everything is sort of on the margins in Washington, and to some extent, it's like, you know, which data do you collect? Which period do you pick? You know, how broad is your data set? You know, and you can -- on the margins, the outcomes can be affected by the data sets that you pick. And it can be factually true and, you know, accurate, but it can influenced by the outcome that you're seeking. ROBERTSAnd also, even how you illustrate the data. I mean, the best example of that, that I know of, during the campaign, was what graph do you use to illustrate unemployment? And you could use one graph that showed a high spike in unemployment, but if you used a different graph, it looked very different. So you can take the same statistics and manipulate them in all sorts of ways. TROYAnd with all due respect, The New York Times can do that too, in the way they write their stories. ROBERTSRight. Right. I think that's certainly fair. Let's -- we've got time for a couple of more callers. And Steven, in Corsicana, Texas. Welcome. You're on "The Diane Rehm Show." STEVENThank you for having me. I had a question about -- you were talking about pushing legislation and all that with the think tanks. Is there a way to get a hold of someone like that, to be able to ask questions about what's going on with certain things, or to push your ideas? Something like that. ROBERTSYou mean, contact someone at a think tank? ANTHOLISIn other words, if you, as a citizen, are interested in advocating for an idea, can you make partner with a think tank? I'm trying to understand the question. One thing that we've launched in the last year -- there's a lot more interactive digital online, social media, connecting directly with opinion leaders, including citizens around the country when we had our -- we have a capital campaign, timed to our 100th anniversary, which is in two years. And when we launched it last October, Strobe Talbott, the President at Brookings announced a Jefferson imperative. ANTHOLISAnd Jefferson believed that -- two things. One, that research and ideas were critical to a democracy, and an informed citizenry was central to that. He founded a public university, The University of Virginia. But also that citizens needed to engage, and so we are keen to get citizen input. So, for instance, we have a lot of blogs now, many of which have commentaries for citizens to bring ideas directly to us and engage with us. We used to have a policy on our website where we would only publish Brookings scholars. LIPTONI have a shorter answer for him. If you have a million dollars, you'll be invited to the 100th anniversary of Brookings, and they'll name a scholarship program after you, and you'll be there to meet with the scholars. And you'll have extensive conversations, you'll be invited four times a year to dinners, to galas, and you know, they'll listen to what you have to say. Now, that may not impact the outcome of their reports, but you'll definitely have interaction with them that you wouldn't have if you don't have a million dollars. ANTHOLISAnd if you write that million dollar check to us, you will get a letter that says that Brookings recognizes that the value it provides is its absolute commitment to quality, independence and impact. And activities supported by its donors reflect this commitment and the analysis and recommendations are not determined or influenced by any donation. ROBERTSI'm Steve Roberts, and you're listening to "The Diane Rehm Show." Tevi, are you seeing the kind of trend that Bill is talking about in other think tanks? Trying to be much more accessible to the general public using social media and other outreach options? TROYYeah, I mean, in response to the caller's question, it's much easier to get in touch with a think tank today, even if you don't have a million dollars. Every think tank, you go to their website and they have a "contact us" button. I know Bill's on Twitter, and we follow each other on Twitter. And you can reach someone that way, you can reach them by emails. They are not the black box that they were, I would say, 30 years ago. ROBERTSLet's turn to -- we got time for, perhaps, one more caller. Mike, in Dallas, Texas. Welcome. You're on "The Diane Rehm Show," Mike. MIKEHey, good to be on the show. I was privileged to speak at Brookings a month ago. My question to both the gentlemen is, there are think tanks about liberal policies. There are think tanks to advocate the conservative policies. What about the pluralistic, moderate policies which a majority of the American moderate -- what do we have to advocate their thoughts and policies? ROBERTSOkay, thanks a lot. Tevi. TROYA new Democrat, trying to bring the Democrats away from the left, that had lost three straight elections, to a party that's now won five out of six popular votes, and four out of six Presidential elections. You have, obviously, Brookings is seen as a center left institution, as I mentioned. AEI says they occupy the center right. ROBERTSThat's the American Enterprise Institute. TROYRight. Bipartisan Policy Center was specifically founded to say that they are bipartisan, so they have former senate majority leaders of both parties sign on to their public policy pronouncements. So again, if you are looking for think tanks of whatever political stripe you are, you are likely to find them. ROBERTSWell, and the Bipartisan Policy Center is an interesting example, reflecting the caller, that there has been a feeling among some more moderate forces, that they are underrepresented in this world. And there are these new institutions that have been created. We only have another minute or two. I'm going to give each of you a chance to sum up here. Eric, if you could drop a few recommendations for where the think tanks should be going. You follow this very closely. You're focused the questions of transparency. What are some of the suggestions you would make, based on your research? LIPTONI think that, just to remember how big of an economic and, sort of, policy force think tanks are, I mean, they -- just the top 20 think tanks in Washington, (unintelligible) if I pulled together a state, $975 million, their budgets combined, the top 20 think tanks. It's a lot of money. They just need to remember that they have an obligation to -- in this post Citizens United era and dark money concerns, to be as forward as possible in letting people understand, you know, where their funding comes from. And it will only enhance their reputations, by being more open and resolve questions about the work that they do. ROBERTSAnd Bill, it sounds like you generally agree with that. ANTHOLISI do. I mean, I'm just -- to keep the show lively, I mean, I think the place where Eric and I would disagree is thinking that every single gift has to be tracked to every single scholar that works on every single report. And the reason for that is that undermines the scholar's own independence. We want our scholars to not think about where their funding is coming from. And in some cases, not even know or care where their funding is coming from. To start with a question, and take that question to its logical research conclusion. ANTHOLISAnd for us, having, as Tevi was saying, having a wide range of funders, you know -- we have 800 funders in any given year. Only 15 of which choose to remain anonymous. It's a very small portion. What we'd rather do is be transparent about who's giving us money, the amounts that they're giving us money. And then give scholars money in an unrestricted way, so they go about and do their research. For us, that's the secret formula. ROBERTSAnd Tevi, from your experience, what would you like to see this world do better? What would you focus on? TROYYeah, a couple things. First of all, I think think tanks should limit their funding from any one source, as I mentioned earlier. Second is, I think they should try and limit their ties to partisan organizations. They should not be trying to advance the interests of the Democratic Party or the Republican Party, but if they have an ideological bent, that's fine. And then third, one thing that we didn't get to talk about, but I saw a report on this yesterday, is try and promote middle range scholars. TROYYou have lots of junior people right out of college working at think tanks, and you have lots of senior fellows with PhDs with multiple years of experience. But you have very few people in that junior range. We need to kind of develop that next generation of scholars. ROBERTSThat's Tevi Troy. He is the President of The American Health Policy Institute. Also author of a new book, "What Jefferson Read, Ike Watched and Obama Tweeted: 200 Years of Popular Culture In the White House." Also with me, Bill Antholis, the Managing Director of the Brookings Institution. His new book is called "Inside Out India and China." And Eric Lipton, a reporter for The New York Times, Washington Bureau, covers lobbying, ethics and corporate agendas. I'm Steve Roberts, sitting in today for Diane.